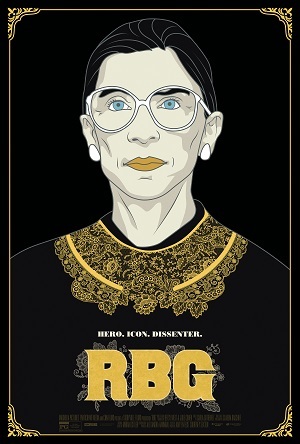 I can’t say directors Julie Cohen and Betsy West have made the most cinematic documentary as far as RBG is concerned. A fairly typical and straightforward talking heads piece, this examination of the life and times of Supreme Court Justice Ruth Bader Ginsburg is still pretty sensational. As aspirational as it is inspirational, the film moves as if it were shot out of a cannon, opening hearts and minds as it analyzes the Justice’s fascinating career in intimate detail. Sara Michelle Fetters: It seems pretty obvious to say that Ruth Bader Ginsburg has lived a fairly incredible life. It’s a life full of chockfull of fascinating tidbits and indelible moments. When did you know that this was a film you needed to make? Julie Cohen: It certainly seemed like a film that needed to be made. It was January 2015 when we came up with the idea. At that point, Justice Ginsburg was at what seemed like the height of her internet fame. Little did we know it was actually about to get bigger. She was starting to get so much attention online with the memes and the “Saturday Night Live” impressions and people getting the RGB tattoos. Betsy and I had each interviewed her previously for two separate projects we had made and, it just hit us. OMG! Somebody needs to make a film about Justice Ginsburg and why not have it be us? Have it be the women who make it? Sara Michelle Fetters: I like that you bring up what her mother told her, “Be a lady, be independent.” That independence yet not losing what makes her a woman, this idea seems to run through the entire documentary in a really vibrant and electrifying way. What do you think that statements meant to you as filmmakers? Did it influence at all what you were trying to say? Betsy West: Absolutely. 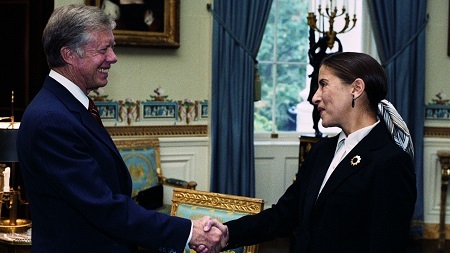 Justice Ginsburg’s mother was tremendously influential. Her two pieces of advice, “Be independent. Be able to fend for yourself.” You see Ruth Bader Ginsburg fending for herself throughout this film. She really is not daunted by challenges. And also, “Be a lady,” which become not succumbing to useless emotions like anger; you see that as well. In making the film, we were sometimes floored by the kinds of challenges that she was facing, stuff like graduating at the top of her class and not being able to get a job. In the Supreme Court, you’re able to listen to the audio tapes of that young lawyer, Ruth Bader Ginsburg, arguing before the nine male Justices. 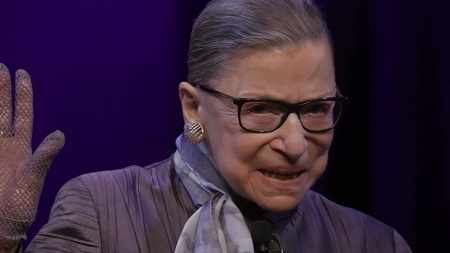 At a certain point she’s making very serious constitutional arguments and then you’ll hear the dismissive, condescending attempts at jokes from the Justices, something that a lesser woman would rise to anger. She always manages it seems to control her and to just keep pushing forward. I found that remarkable and also personally inspiring, thinking about what she faced and how she pushed through without ever losing her temper. Sara Michelle Fetters: One of the most interesting things about the film is that you put so much emphasis on her life before becoming a Supreme Court Justice. There’s just as much heroism and just as much that’s inspirational there, if you will, as anything that she’s done on the while a member of the Supreme Court. Julie Cohen: I think that’s right. We focus so heavily on the work that Justice Ginsburg did securing equal right for women and men under the Constitution in the 1970s because that’s a tremendously important part of the work that a lot of people, including a lot of Justice Ginsburg’s big fans, don’t know about. It’s a reminder of some of the holes in our ordinary telling of history. That should be part of the common knowledge that’s in textbooks. We don’t write textbooks, we make documentaries, so we wanted to get that in. We wanted it to be a major part of our film because it’s fascinating and it’s part of her legacy. Even if she had never become a Supreme Court Justice she earned a place in history for what she did for women. Sara Michelle Fetters: Just considering how much she’s gone through, how much of an impact on U.S. society she’s had over the decades, it seems like most people never got the opportunity to know any of these things. Betsy West. That’s so true. Frank Chi, who’s one of the meme makers who was really captivated by Justice Ginsburg’s words, said that it was really the first time that he and many young people understood the impact that the Supreme Court has on everyday people’s lives. I do think this explains part of this fascination with her. Suddenly, people are seeing her words and her work and identifying with that; understanding how important the Court can be on American society and the impact that it has. Sara Michelle Fetters: During your various chats with her, what strikes you the most about them? What surprises you each time you sit down? Julie Cohen: I think the surprising thing about Justice Ginsburg is that behind that serious, sober, judicial persona there’s a real human being with a lot of humor, a real romantic streak and this passion for the arts, particularly opera. I feel like it’s hard for an ordinary person to understand. She’s so deeply moved by music. When she saw the film for the first time, which was at Sundance, the first scene that seemed to bring her to tears was just watching herself watching the love duet from “Lucia di Lammermoor.” It’s not what you think of when you think of a judge in general or o Ruth Bader Ginsburg in particular, but that’s her. 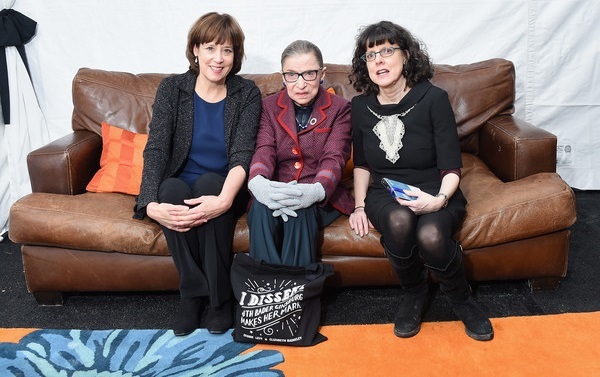 Sara Michelle Fetters: As you brought it up, I just have to ask, what was it like taking Ruth Bader Ginsburg to Sundance? Betsy West: It’s nerve-wracking! Julie and I sat across from Justice Ginsburg at the premiere and our eyes really rarely strayed to the screen. We were just glued to her and watching her reaction, sort of holding our breath because you know she at that point was our most important audience. She’d laugh, and Julie said she cried. Early on she pulled out a tissue and she did wipe away a few tears but overall she just seemed to be completely engrossed and enjoying the story. Afterwards she was very gracious to say that she liked it and we were supremely relieved. As for bringing her to Sundance. She’s a rock star. People just flock to her. It’s incredible. Sara Michelle Fetters: Does it hit her that she’s has become this cultural rock star? What does she think about that? Julie Cohen: Yes. Justice Ginsburg does seem to be aware of her icon status. I mean, how could she miss it? Every time she goes and does a talk at a law school there’s just these throngs of people there, including people who don’t have tickets, who just want to wait basically outside the stage door to get her to autograph their copy of The Notorious RBG. It’s amazing. Other times it’s a picture or something they have that they’d like signed, or they want to take selfies, stuff like that. Her granddaughter told us that initially she found that quite unusual and surprising but that she’s basically decided to embrace it because it allows her to do what she loves to do which is educate. I think we captured that in the film. A number of times a sly smile creeps across her face when she sees herself with a fanbase. I think, particularly as an 85-year-old woman, that must feel pretty special. Our culture is famous for worshiping youth and here’s someone who’s hit her peak, is at her peak celebrity at the top of her game, at 85. That’s pretty cool. That’s part of the story we wanted to tell. Sara Michelle Fetters: Thinking about that sly smile, there are moments in the film where you do kind of wonder how much longer can she keep doing this, how much longer she can go on as a Supreme Court Justice. But you just look at that smile and you get the feeling that she is going to stay on the Court for as long as it takes to do what she feels is right. Betsy West: Yes. Justice Ginsburg loves the law. She has loved the law her whole life and has dedicated herself to the law. She seems very determined to keep herself in good shape. We were very fortunate to get into the gym and to be able to record her extraordinarily rigorous workout which she is dedicated to. It’s part of what she has to do to just make sure that she’s capable of continuing the work she loves. Justice Ginsburg has given a little bit of a signal of what she intends to do in the future by announcing the selections of her Supreme Court clerks, not just for next year’s term but for the term afterwards. That takes her through 2020. That seems to be an indication that she is determined to carry on for at least a few more years. Sara Michelle Fetters: This isn’t so much about Justice Ginsburg it’s more about the Supreme Court as a whole. Do you get the feeling that, especially for I want to say the more progressive voices on the Court, that none of them look like they’re going go anywhere anytime soon? Julie Cohen: I actually think it’s hard for us to make that judgment. Justices very rarely telegraph their intentions, which is what made Justice Ginsburg’s announcements about her clerks going forward unusual. But beyond that it’s not something they’re talking about. I mean, truthfully, some of the justices that you’re talking about on the Court’s liberal wing are among the younger justices. 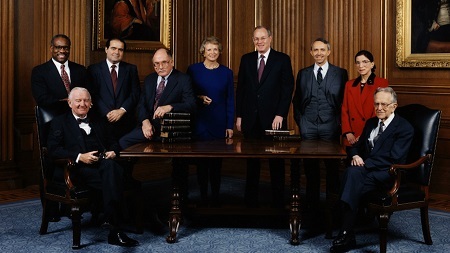 The Obama appointees, Justice Kagan and Justice Sotomayor, are relatively young Supreme Court Justice-wise. What will happen with Justice Pryor and Justice Kennedy has been the subject of some speculation. I don’t think we could pretend to know what they’re going to do, especially Justice Kennedy. Sara Michelle Fetters: How important is a film like this, one that is inspirational in so many ways about an iconic individual yet is also so aspirational in regards to what we, as an audience, as citizens of the United States, can potentially rise to become as human beings? Julie Cohen: Wow. That’s a tough question. Obviously I think the film is important and I want people to see it. I’d be lying if I said otherwise. More than that, I think there’s a lot in Justice Ginsburg’s example to aspire to. Her lifelong toughness, her water-off-a-duck’s-back style of not letting things that would really, you know, crush others but never seems to get her down, all of that is inspiring. Her not trying to curtail the anger that she must have felt by being treated unfairly at various points in her life. We can relate to that. I don’t know. Her story, it gives us as human beings something to aspire to. If people watched this film and had thoughts about how you deal with adversity, learn ways of how to be civil with friends or with colleagues that disagree with you, then I think we’d feel good about that. Justice Ginsburg’s example is a good one to aspire to, I definitely agree with you one that. Sara Michelle Fetters: I know you’re both very busy so I don’t want to keep you much longer. I just want to ask, at the end of the day, now that people are going to start seeing this outside of the film festival circuit, what do you hope they’re talking about? What do you want them to take away? Betsy West: We hope they take away an appreciation for an extraordinary life and then, perhaps, they learn not only about what Justice Ginsburg did but how she did it, about her approach to life. She is both a very practical and a very optimistic person. She takes the long view about our world and she says, “Hey, times may be tough but look how far we’ve come.” She has a very, it seems to me, practical approach to how to make change, how to do it, never in anger, but logically, deliberately step-by-step. I think a lot of people can learn from that and be inspired by her story. Julie Cohen: As your question suggests, we’re really excited for this film to start playing for a broader audience and we’re hoping they learn something and we’re hoping they walk away infused with a little bit of the exuberance that’s part of the Justice’s story. A lot of the film we think is fun to watch. A lot of it is funnier than you might expect for a film about constitutional law. There’s a lot of rancor in our country right now and bad feelings on all sides. Some of the audiences that have been seeing the film have been coming out saying they feel pretty good. We had a screening last night and when the audience saw Justice Ginsburg they just started cheering. That’s very empowering and fills us with hope. If fans of hers come away feeling really good then we feel good about that. If non-fans or people who don’t really know anything about her come away feeling anywhere close to the same, we feel pretty darn great about that, too.